Arizona is one of the most visited states in the entirety of the USA, coming in at number eight out of fifty. Boasting mild weather (outside of the summer months), ample activities, and some of the most diverse landscapes in the country. And though I grew up in the capital of Phoenix, it wasn’t until I returned with Michael that I fully appreciate the beauty and diversity of my home state. While many might only think of the Grand Canyon or the shopping and golf courses of Scottsdale when they think of Arizona, there is so much more that this state has to offer. Therefore, if you’re looking for the best stops on an Arizona itinerary, look no further. Though this is only a 5-day Arizona itinerary, there are ample opportunities to spend more time in each place and to add a few more depending on your timeframe. Before I jump into the details of you perfect 5-day Arizona itinerary, let’s discuss the best season to visit this southwestern state. While it’s geographical positions means that the weather tends to be sunny and warm most of the year, it is worth noting that the climate can change drastically depending on the region you are visiting. For instance, if you are visiting Phoenix in December and enjoying basking in some 20°C (68ºF) weather but also want to visit the Grand Canyon on the same trip, be well prepared for lots of snow and temperatures well below freezing. While the area surrounding Phoenix and south have incredibly mild winters, the rest of the state often enjoys heavy snow and very cold temperatures. One of Arizona’s largest cities, Flagstaff, even has its own ski resort! The temperatures work the other way, as well, and it is worth noting that if you plan to travel to Arizona in the summer months, be prepared for extremely high temperature. Phoenix has the highest average temperatures of any capital in the US and it is not uncommon for the mercury to rise to well over 40ºC (104°F). Most residents of the Phoenix metropolitan area will try to get out of town if they can and it is considered to be the off-season in the tourism industry. However, if you venture north to Sedona, Flagstaff, and the Grand Canyon you will notice that temperatures in the height of summer can be immeasurably more mild than farther south. So if you want to visit Arizona as part of a longer southwest road trip in the summer months, it might make more sense to skip anything south of Sedona unless you love extremely high temperatures! Arguably the best time to embark on any Arizona itinerary is in the Spring or Autumn months. The weather is mild and sunny throughout the state, though the nights can still get chilly. You will need to pack for a couple of different climates regardless of which season you choose to visit in, however, the spring and fall temperatures tend to be a little bit more even throughout Arizona. The Devil’s Bridge in Sedona, perfect to visit any time of year! If you want to get the highlights of this beautiful state but don’t have a lot of time to devote to it, then I would recommend spending five days in the lovely southwestern state. 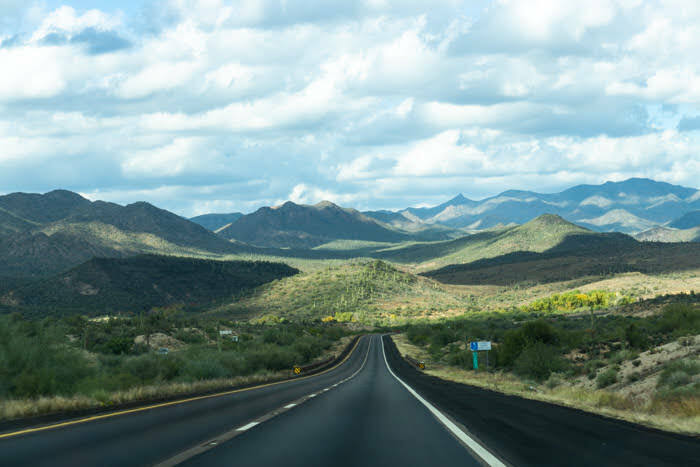 Though this Arizona road trip itinerary might have you moving from place to place a bit more than we would typically recommend, it does allow you to see a lot without exhausting yourself. Beginning in Phoenix and ending in the Grand Canyon, this is the quintessential Arizona road trip itinerary. As the capital of Arizona and one of the largest cities by population in the United States, the Phoenix metro area has a lot to offer tourists. Though visitors can easily spend more than one day in Phoenix, if you want to get the most out of this five-day Arizona itinerary, the one day will be just enough. If the weather is fine, take the morning to go for a hike up the iconic Camelback Mountain before exploring nearby historic downtown Scottsdale. The Old Town area is filled with interesting shops, cafes, and restaurants that are sure to keep you entertained. If you want to get into more serious shopping, Scottsdale Fashion Square is one of the largest shopping malls in the country and has a number of large department stores and luxury brands. If shopping isn’t necessarily your thing, you could easily spend the entire afternoon exploring the Desert Botanical Garden where you can learn all about the native flora in Arizona in a beautiful setting. If you’re travelling with kids, the Phoenix Zoo is located right next to the botanical and is always a favourite among families. End your day at one of the Pheonix area’s great restaurants and maybe check out some of the famous nightlife in the Downtown area, Old Town Scottsdale, or near Mill Avenue in Tempe. Phoenix is the ideal place to get a feel for the state when beginning your epic Arizona road trip itinerary. Airbnb – If you want to save some money on your Arizona itinerary or just stay in some unique accommodations, then Airbnb is a great option for you. There are numerous properties available throughout Phoenix and Arizona in general that will suit any personality or budget. If you are new to Airbnb, you can click here to get up to $40 off your first stay. On the second day of your 5-day Arizona road trip, it is time to head north and begin to experience the dramatic and diverse natural scenery of the state. This day, we recommend spending the night in picturesque Sedona. Though the Phoenix to Sedona drive only really takes about 2-2.5 hours along the I-17, we would suggest taking your time on this journey as there are a number of stops you can make. If you’re looking for a scenic drive from Phoenix to Sedona, a far prettier alternative to the I-17 is to take State Highway 87 toward Payson. While this isn’t a direct route to Sedona, the smaller road and stunning natural scenery are absolutely unbeatable, no matter the season. A good stopping point on the Phoenix to Sedona drive along highway 87 is at the Tonto Natural Bridge, just outside of the small city of Payson. Located about 1.5 hours out from Phoenix, this natural site is equally as stunning as some of the attractions to come on this AZ itinerary, however, it sees just a fraction of the crowds. The Tonto Natural Bridge is tucked into the lush pine forests of Northern Arizona and is believed to be the largest natural travertine bridge (or natural stone arch) in the world. Entry to the State Park is $7 per adult and there are four different viewpoints where you can see the bridge from all angles. There are also numerous hiking trails around the bridge of varying difficulties. Depending on the weather, you could easily spend a number of hours at the Tonto Natural Bridge while on your Phoenix to Sedona drive. After visiting the Tonto Natural Bridge, continue along the highway until you reach Sedona. If the Tonto Natural Bridge doesn’t interest you and you would rather take the I-17 for your drive from Phoenix to Sedona, then you could easily make a detour to the lovely town of Prescott, AZ. Located about a 20-minute detour from the I-17 and about equidistant between Phoenix and Sedona, Prescott is a charming Northern Arizona town with a quaint main square, a lot of interesting shops, and a laid-back vibe. It can be very worth stopping here for a couple of hours to explore. All in all, no matter which route you decide to take, there are a number of beautiful stops you can make on the Phoenix to Sedona drive. After enjoying your leisurely drive up to Sedona the day before, it is time to spend day three of this Arizona road trip itinerary exploring the city of red rocks! Sedona might well be the most beautiful city in Arizona — set amongst the backdrop of stunning red rock formations and high-desert landscape, this city has inspired New Age thought and creativity for decades. There are a number of fantastic things to do in Sedona, from world-class shopping to some of the best hiking in the state. Sedona is a popular weekend destination for Arizona locals, meaning that there are a number of fantastic restaurants and cultural events in the city as well. While you can easily spend a day in Sedona only going for a hike or horseback ride, we would recommend trying to fit at least two activities into your day in order to really get the most out of your short time in Sedona. If you like to hike, begin your day with the iconic Devil’s Bridge hike. While this is a more popular trail in Sedona, it is short enough to do in a couple of hours and easy enough for most skill levels while still being challenging enough for more experienced hikers. Also, the landscape and views are simply amazing and well worth meeting a few people on the trail. However, in order to avoid some larger crowds on the Devil’s Bridge trail, which is only located a bit outside of central Sedona, it is best to get on the trail in the morning. Spend your afternoon exploring the eclectic shops in the Tlaquepaque centre, which is filled with a number of small, locally owned businesses well worth checking out. All in all, spending one day in Sedona is one of the best additions to your 5-day Arizona itinerary. On the fourth day of your 5 days in Arizona road trip, it is time to leave Sedona and drive to the most iconic of Arizona attractions: the Grand Canyon. The Sedona to Grand Canyon drive only takes about 2 hours, so it can easily be done as a day trip from Sedona. However, this may not be the best idea, especially if you have five days or more to devote to your Arizona itinerary. The Grand Canyon is one of the most spectacular natural sites in the world. It is also incredibly massive and travellers could easily spend days exploring this amazing wonder. If you’re interested in making any stops on the drive from Sedona to Grand Canyon South Rim, we would recommend getting out in Flagstaff, the largest city in Northern Arizona and a lively university town. This is the only place that is really worth exploring on the way. If you’re interested, you can spend a few hours exploring Flagstaff, which is about an hour north of Sedona. The town has a number of cool coffee shops and restaurants and a young population due to it being the home of Northern Arizona University. From Flagstaff, it takes about another hour to reach the South Rim of the Grand Canyon. If you are travelling in the winter months, only the South Rim of the Grand Canyon will be open to visitors, as the North Rim gets far too icy and snowy for it to handle many visitors per day. Once you reach the Grand Canyon, take the time to enjoy the beautiful views and vistas of the canyon by walking along the easy, paved rim trail. Make sure to walk past the main viewpoints, as many people only take the time to snap a few photos and then get in their cars and leave. If you walk only a couple hundred metres from the busiest viewpoints along the rim trail, you could easily feel as if you have the whole Canyon to yourself. The Grand Canyon is one of the unmissable additions to any Arizona itinerary. Not quite what you’re looking for? Click here to find other hotels near the Grand Canyon! The last day of this 5-day Arizona road trip itinerary sees you exploring a bit more of the Grand Canyon by day before making the long drive back to Phoenix by the evening. After spending your first day walking the along the South Rim of the Grand Canyon, it’s time to check out one of the many trails around the Grand Canyon and see this natural wonder from a different perspective. Depending on how much time you want to spend, your fitness level, and the season you’re visiting the Grand Canyon, there are numerous trails to choose from. Pick up a map from the tourist info centre to make sure you have all of the best information. If you’re visiting the Grand Canyon between the months of May – October, it is possible to take a trip to the lesser-visited North Rim and experience a different side of the Canyon. However, this rim is closed to visitors in the winter months due to extreme weather conditions. After exploring more of the Grand Canyon, it’s time to make the long drive back to Phoenix in the afternoon. It is about a 4-hour drive from the South Rim to Arizona capital and it is easiest to make the drive along the I-17. If you have more time to devote to your Arizona road trip, there are a number of additions you could include while using this route as a template. If you’re planning an Arizona 1 week itinerary, we would recommend spending an extra day each in the Phoenix area and in Sedona. This will allow you to see more of the attractions in both cities. Phoenix has a lot more to offer travellers visiting for more than just one day, as does Sedona. If you have only time for a 3-day Arizona road trip itinerary, then that is perfectly doable as well. Spend your first night in Phoenix, enjoy the Phoenix to Sedona drive and explore the town of Sedona on the second day, and then head the Grand Canyon bright and early on the third day in order to spend as much time as possible in this beautiful site. All in all, there are many ways you can plan out the quintessential AZ itinerary, no matter how much time you have to spend exploring this southwestern state. Are you planning an Arizona itinerary? Have you visited Arizona before? Let us know in the comments! Maggie, thank you for the information. My family and I, (2 adults two boys 9 and 6) will be visiting in August…I know it will be hot but we’re from NYC and have traveled to Vegas in August before, will it be unbearable or do you think if we are mindful to stay hydrated and dress appropriately we will be ok to explore? I would love to take my sons hiking and do as many nature based activities as possible. We will be in Arizona for 8 days so any suggestions are welcome for activities and ‘nicer’ accommodations. Hi Melissa, thanks for your comment! Yes, August will be VERY hot, especially in Phoenix or anywhere south of there — it does tend to be the hottest month and you should expect high temperatures to be well over 100 degrees farenheit every day. That being said, it is obviously a different heat than NYC and I personally find it to be a lot more bearable. The early mornings (usually before 9AM) can actually be quite pleasant, so if you want to do any outdoor activities, plan to catch the sunrise. Heat stroke is a serious problem affecting a lot of tourists, so please be sure to stay hydrated. And, obviously, sunscreen is a must. In terms of accommodation, make sure to check out some of our recommendations in the article above. Hope you have a great trip! Hi Maggie, I would love to include Zion and Bryce National Parks to the above itinerary. We would have around 10 days or more if needed to do the area. I haven’t got a picture yet of how far apart these areas are. Is it doable? Hi Pam, if you have 10 days to spend the region then adding Zion and Bryce Canyon to this itinerary is definitely doable. From the Grand Canyon, it would take roughly 2-3 hours to drive to either park, depending on where you are. The increase of drive time would come if you’re planning on starting and ending in Phoenix, as the drive back from southern Utah will take around 7-8 hours.